Magma's original "Bait/Filet Mate" tables have an attractive new look, BLACK! This color core material has thin white cap layers and a bright black center. 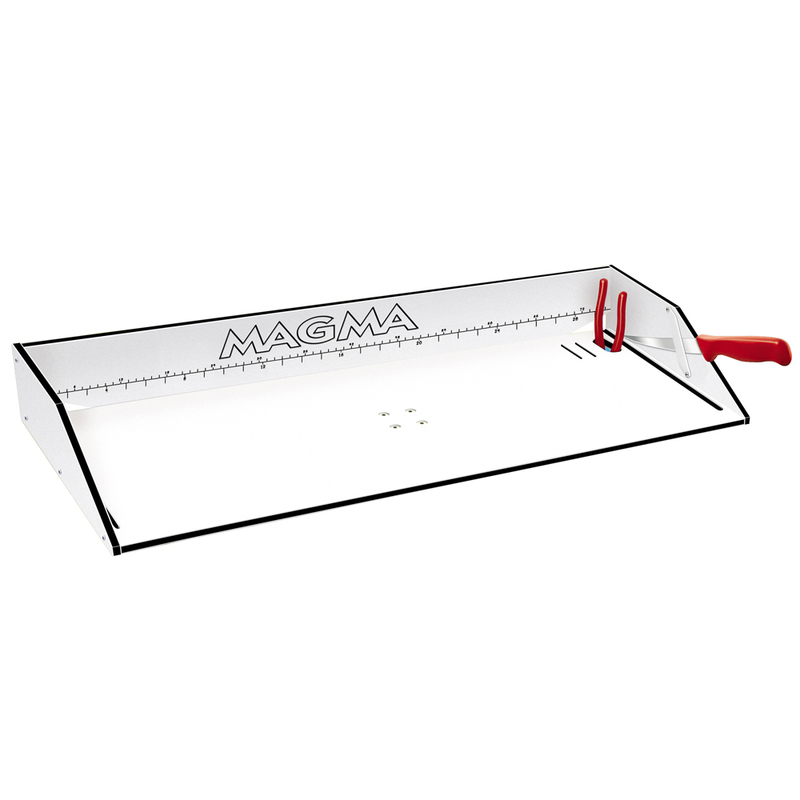 Our "Magma" logo and handy new ruler has been engraved to show the black core for a clean look while increasing visibility when measuring the days catch. Not just designed for bait preparation or fish cleaning but can also be used for food or cocktail service. Constructed with the finest commercial quality high-density polyethylene that is virtually indestructible, practical, will not absorb fish odors, and more sanitary than wood filet tables. This material is UV stabilized and FDA approved for mildew free, crack free, and maintenance free use. Equipped with (2) redesigned knife holsters that accommodate larger filet knives, handy receptacle for Pliers, rounded edges / corners for safety, and side channels with a slotted table back that permits drainage from the work surface while keeping your deck clean of scales and residue when preparing, cleaning, or filleting. Our T10-302, 20" model, is the perfect addition for any Fisherman with a small open craft where storage is limited while the larger T10-303, 31" model, is big enough for any bait work or filleting those big ones that did not get away.